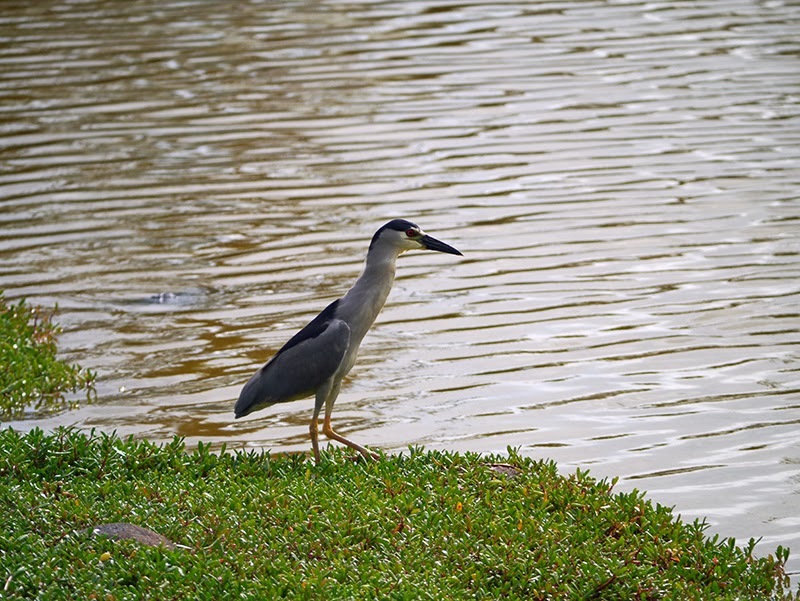 Although our time in Maui was marked by many quiet moments on the water, most of our pictures seem to be land-based. 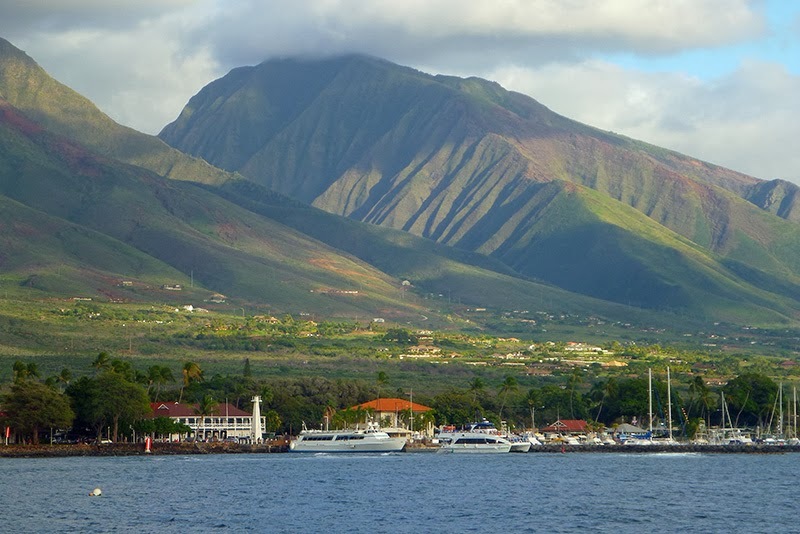 After the experience of being tethered to a seawall in secluded Radio Bay, we relished being in an anchorage again---if a busy one---at Lahaina, and enjoyed the beautiful views from the cockpit. We picked up one of the Lahaina Yacht Club (LYC) moorings in front of the old Lahaina waterfront. After we cleated off our mooring lines, I dove on the mooring to check out its condition. I was happy to see that our mooring was in excellent condition. The piece of chain attaching it to the cement pad at the bottom was new; it had two new shackles (both of them lock-wired) attaching the chain to the float and to the pick-up line. All of the eye splices (except the one on the boat end of the pick-up line) had either a metal or plastic thimble in them for chafe protection. As we had heard, the Lahaina Yacht Club does maintain their moorings. However, we have learned from the misfortunes of others that it is always necessary to check your mooring. The first mooring we had tried to pick up had a broken pick-up line. When we reported this to the yacht club, they were appreciative and stated that a survey of the moorings needed to be done because some of their positions (lat and long) were no longer as shown on their map. (They had been moved during previous maintenance.) 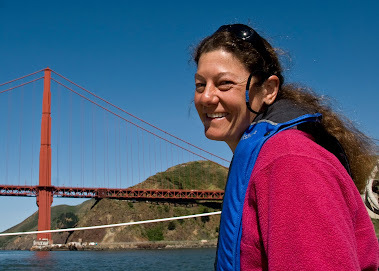 Since the LYC had accepted our Seven Seas Cruising Association membership in lieu of a reciprocal yacht club membership and given us a "Visiting Yachtsman's" card, we volunteered to do the survey. 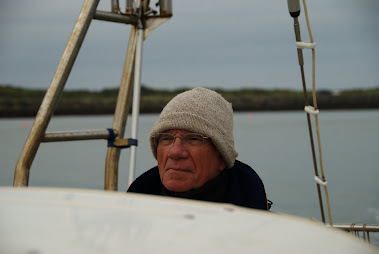 We spent an hour in the dinghy one morning trying to locate all the LYC's moorings and assess their condition, and we used our hand-held GPS to record their current positions. We found half in usable condition, half with issues we could observe at the surface such as broken pick-up lines, missing markings, or unoccupied floats that were almost submerged from being positioned too deep. The yacht club thanked us for our work and stated that an overhaul of all the moorings was due this summer in order to prepare for the Victoria-Maui Race. As part of that work, the LYC plans to replace their current mooring floats with reflective ones. 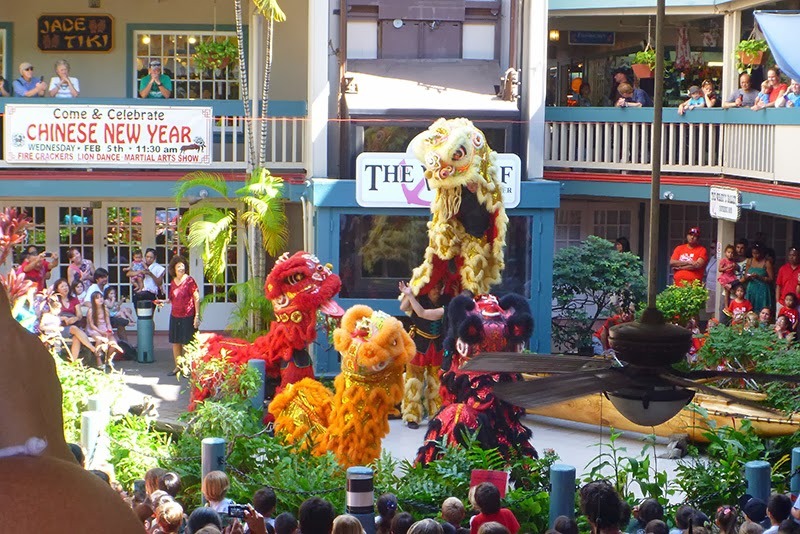 While Hilo was the perfect place to re-enter the United States, after seven weeks of its laid back pace, we were ready for a little excitement. Lahaina was just the ticket. While the waterfront definitely caters to tourists (have your picture taken with a macaw!) and is a hub for sports fishing, whale watching, and snorkel and dive boats; and its street front boasts eateries, boutiques, jewelry stores, souvenir shops, ice-cream parlors, and art galleries galore; the infrastructure of the place remains low level in stature, and there are people living non-tourism based lives in the hills above the harbor. Lahaina had the same laid back and friendly vibe as Hilo but a slightly faster pace. We enjoyed wandering around the streets of Lahaina, where we found both eclectic private residences and historic buildings alike. The coral block stockade of this prison was used to "lock up rowdy sailors who failed to return to their ships at sundown as well as unruly natives." I spent some time one afternoon visiting an art gallery in Lahaina and discovered a new surrealist painter---Vladimir Kush---whose work I liked. Mr. Kush is a multi-media artist, but I liked his paintings (and some of his sculptures) the best. His work has echoes of Dali or Magritte, but are less dark, containing images of transformation, hope, and love. 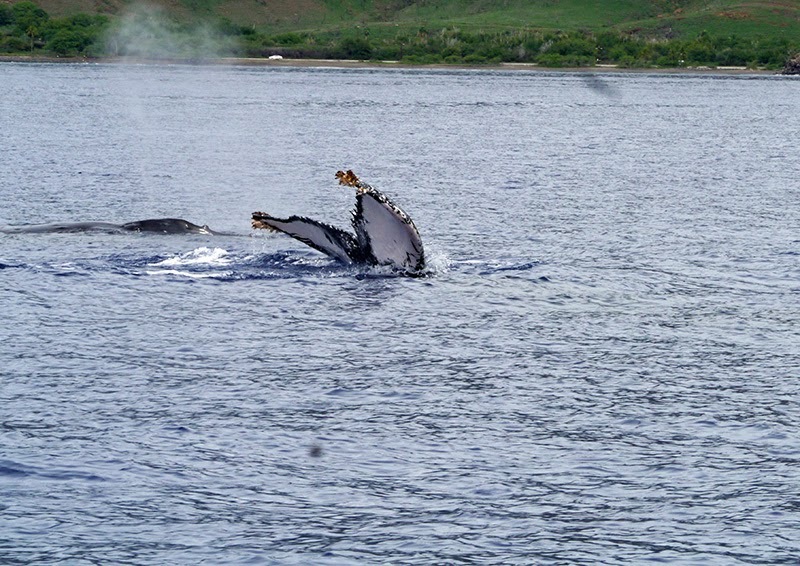 The most memorable parts of our time in Maui were our encounters with humpback whales. I have never seen so many whales breach in all my life! The whales seem to favor what the meteorologists around here call the “Maui County leeward waters” (the sheltered waters around Maui, Lanai, and Molokai). While you see whales in the channels, they seem to use the channels in the same way sailboats do: to get from one place to another. 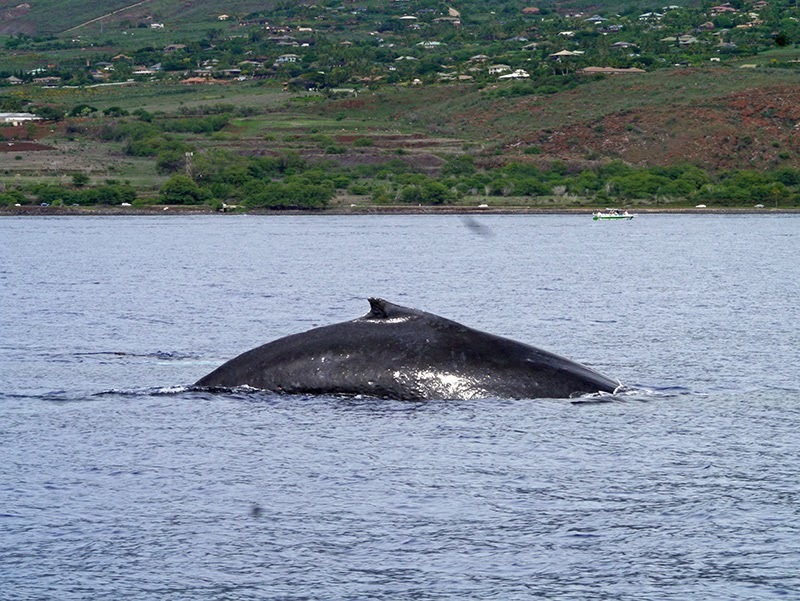 There are also humpback whales cavorting off the islands of Hawai’i and Oahu, but you don’t see them in the same numbers as in the Maui County leeward waters. One very special encounter we had while anchored off of Lahaina was to hear the mating calls of humpback whales through the boat’s hull. I have always read about this but never experienced it first-hand. 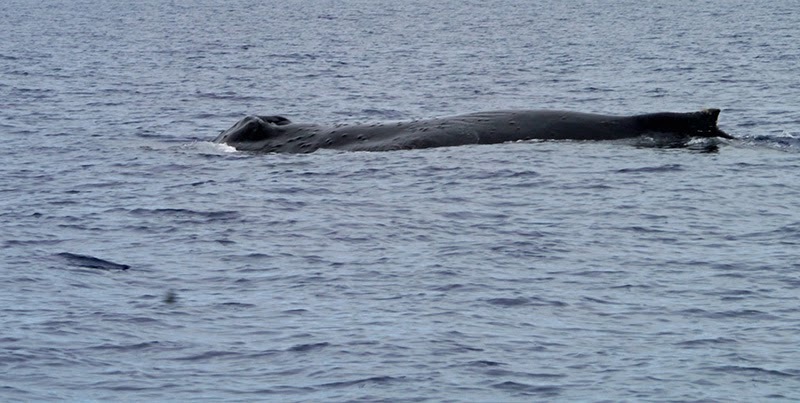 We were lying in bed one night and heard the sonorous deep bellow and cow-like groans of the male humpback being answered by the more high-pitched chirrup of the female. The chorus was so loud that I ran up to the cockpit, expecting to see---or at least hear---whales on the surface. Nothing. All this action was taking place underwater. Ragged-edged flukes festooned with seaweed? 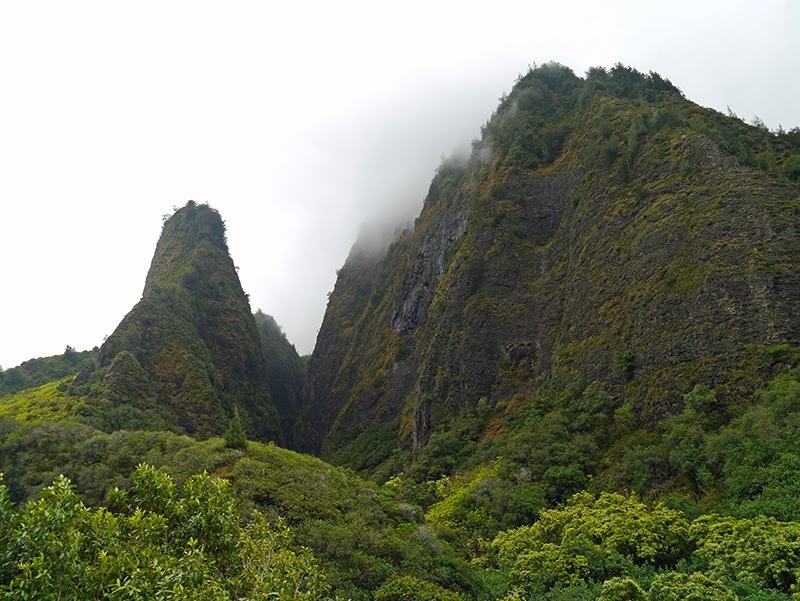 Maui has a good public bus system, and we used a combination of bus and taxi to make a side trip to the Iao Needle in Iao Valley State Park near Wailuku. 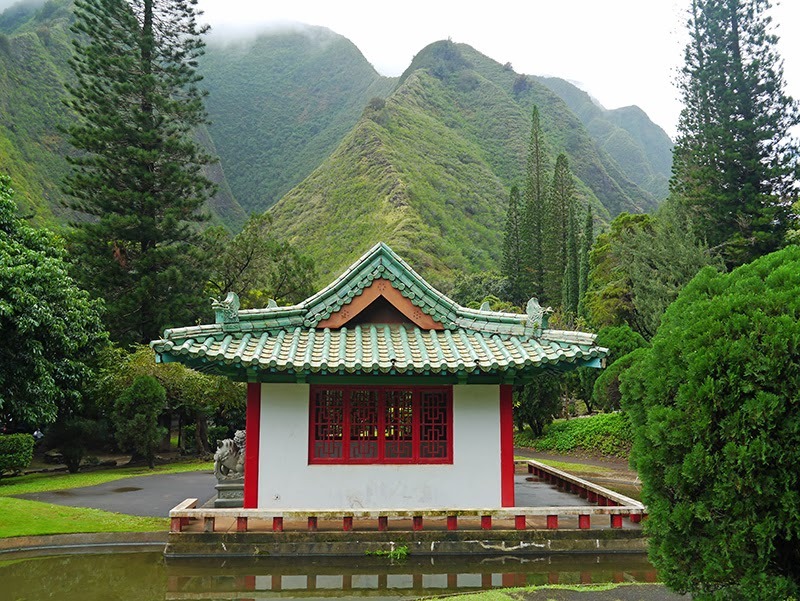 We decided to walk back to the bus stop instead of taxi, and on our way back we discovered a park containing a centennial garden in honor of the first Japanese to emigrate to Hawai’i, as well as Korean and Puerto Rican centennial memorials. 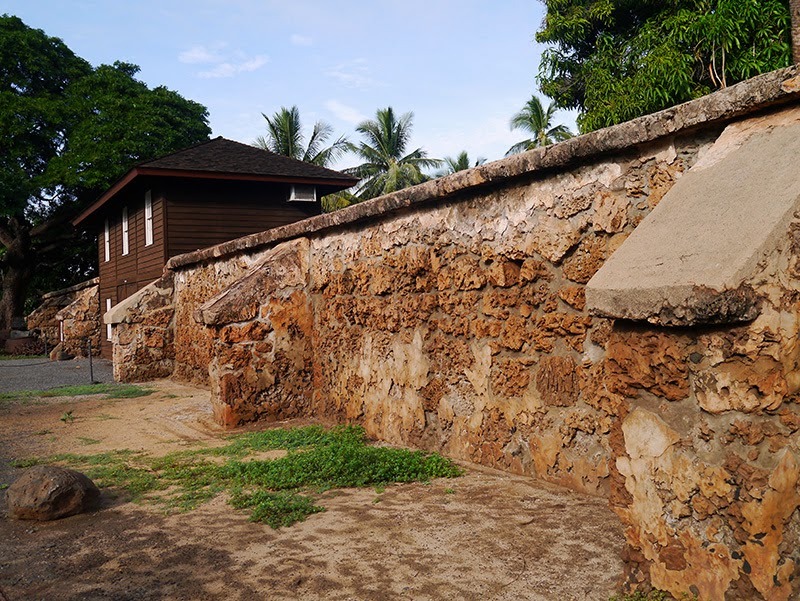 These memorials, dedicated by the descendants of these early immigrants, express gratitude for the sacrifices made by their forbearers and celebrate the contributions that other cultures have made to the history of Hawai’i. As the sugar cane industry grew throughout the islands in the late 1800’s and early 1900’s, an immigrant labor force was imported from China, Japan, the Philippines, Korea, Puerto Rico, and Portugal to work in the cane fields. In a story mirroring what had earlier occurred on cotton plantations in the south, white sugar barons in Hawai’i exploited a labor force made up of people of color, affecting both race relations and the environment in Hawai’i for the next century. While conditions for early workers on sugar plantations were not as bad as for slaves on the mainland, they were like those of indentured servants. 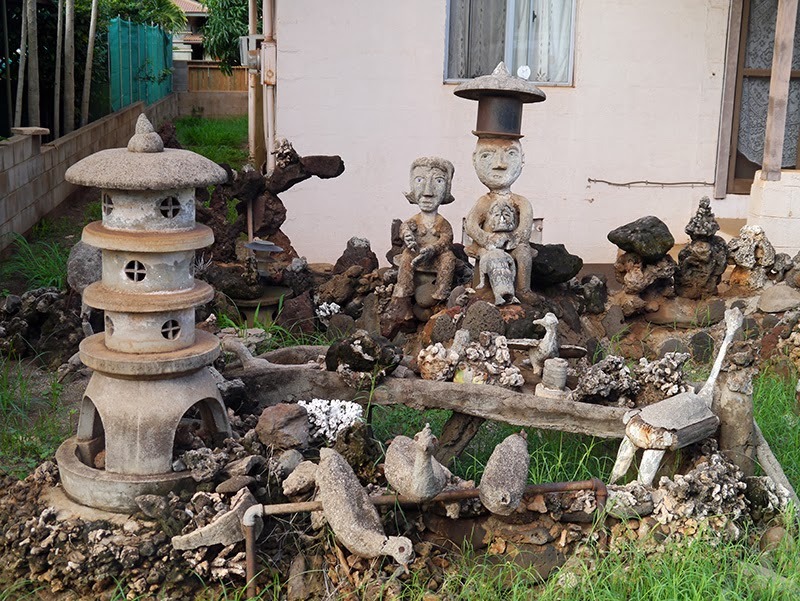 However, at the end of the sugar plantation era, many of these immigrants stayed on, growing their families and starting their own businesses in Hawai’i, and life improved for succeeding generations. One hundred years ago the first government contract immigrants from Japan set foot on these shores and entered the ranks of the sugar industry labor force. By 1924, when Japanese immigration was effectively ended by a new American immigration law, some two-hundred-thousand Japanese both under contract and “free,” had come to Hawaii. Some returned to Japan or moved on to the mainland United States. However, many remained and became the pioneer generation of Japanese in Hawaii. These pioneers had the courage to leave their homeland and to persevere in establishing themselves in a foreign land. They endured many hardships and made many sacrifices which benefited their descendants and contributed to the development of present day Hawaii. 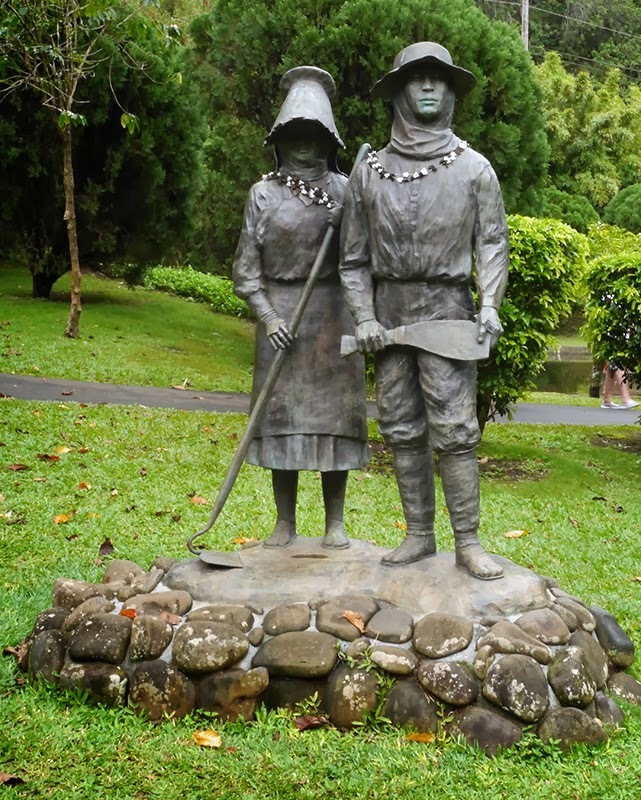 With solemn humbleness, heart-felt appreciation, and a sense of reverence, we, the present beneficiaries, dedicate these bronze statues of Japanese cane-field workers so that their aspirations, hardships, and contributions—along with those of the pioneers from Hawaii’s many other ethnic groups—will be remembered for generations. Our tears of gratitude now transcend time to mingle with their tears of sacrifice. In many ways the story of Hawai’i---like the story of mainland U.S.A.---is the story of past exploitation that has changed for the better. One of the places we visited on Maui was a whaling museum in an unlikely location---a mall called “Whaler’s Village”---which we never would have visited without my Lonely Planet travel guide. The museum had models of whaling ships and whale boats, a well preserved collection of whaling implements and artifacts, and a large collection of scrimshaw and items made out of whalebone by whalers. There, I saw my first “whaler’s valentine,” which was an ornate boxed or framed design whalers made out of tropical shells found during their voyage for their sweethearts back home. I learned that whalers used rubber stamps to detail the condition of whales sighted and caught during the day in the ship’s log. Detailed interpretive signage (as well as an audio tour) informed visitors both about the whaling process and what it was like to be a sailor on a whaleboat. While I am against whaling today (with the possible exception of the Inuit who have few other food sources), I can still appreciate what a challenging and dangerous life whalers must have led. The museum is nicely done because while it details the grisly process of whaling in history, a central theater plays a video highlighting the nature of our changing relationship with whales today through research and human encounters with whales through whale-watching and ecotourism. 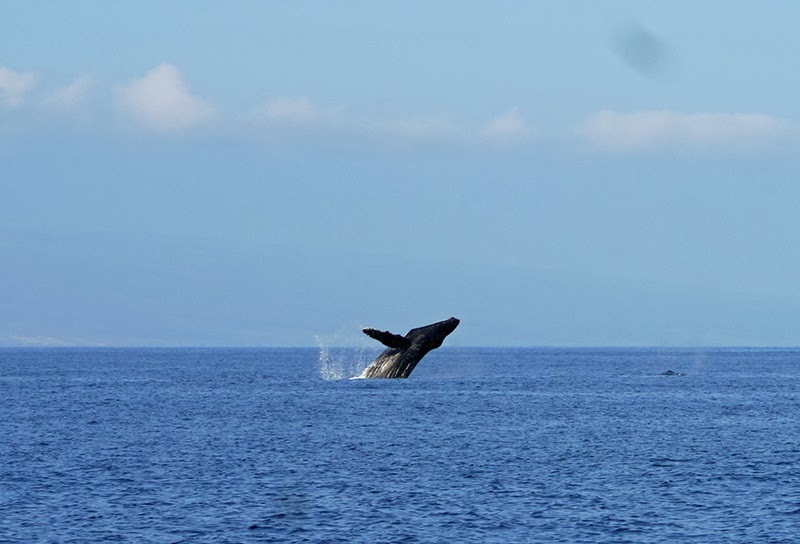 Indeed, in Lahaina and elsewhere throughout Hawai’i, whale-watching tours are a mainstay of the tourist industry. A cynic might say that humans are still exploiting whales for profit (which is true on one level), but the difference is that today the exploiters are also engendering a sense of appreciation for whales and a desire to protect them. I was impressed while observing the whale-watching boats in Lahaina that by and large, they kept the legal distance from the whales and did not crowd the whales. This is different from other countries we have visited, such as Tonga, whose whale-watching industries are less regulated. 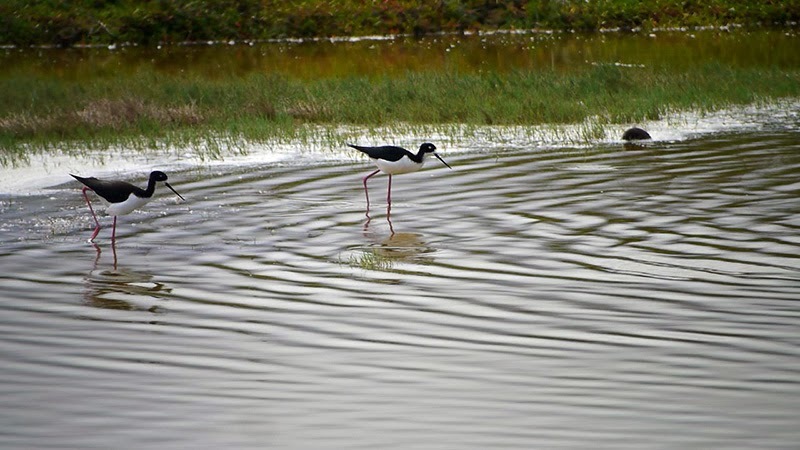 There are two wildlife sanctuaries on Maui, Kanaha Pond State Wildlife Sanctuary on the north side of the island and Kealia Pond National Wildlife Refuge on the south, which are home to native birds like the Hawaiian stilt and coot and are also resting stops for migrating birds. 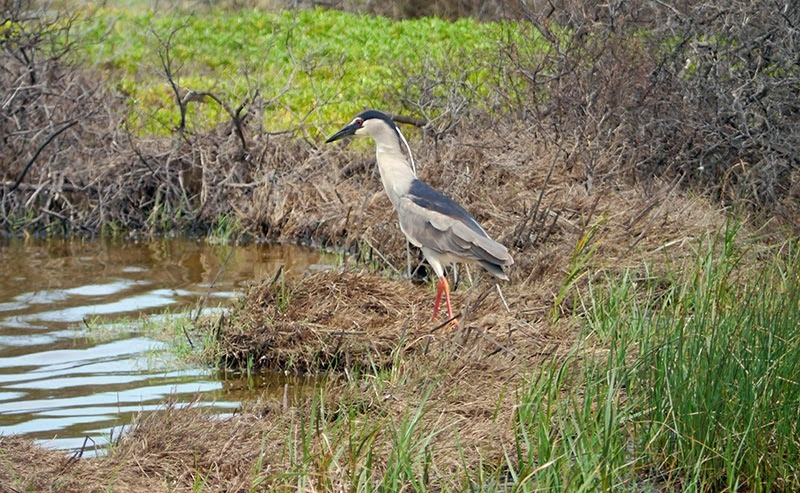 We visited Kanaha Pond on a bus trip to Kahului. 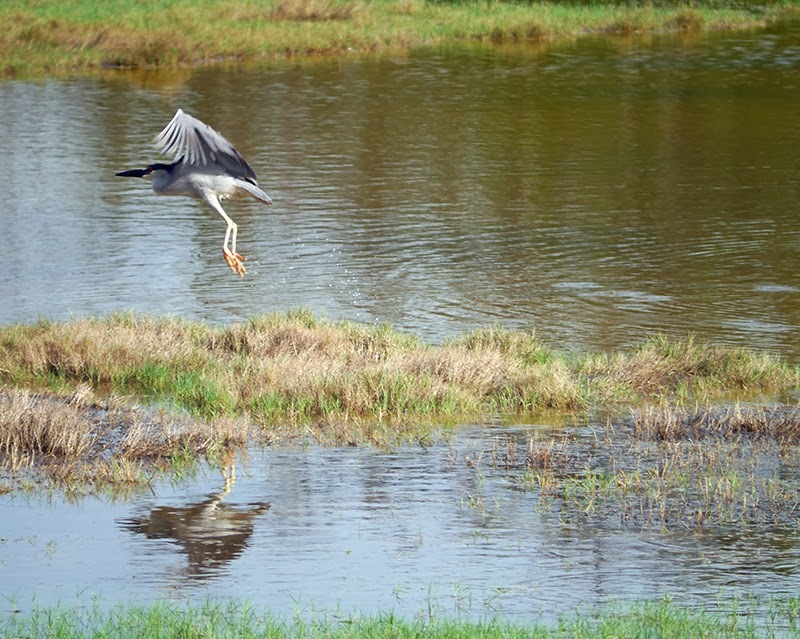 Kanaha Pond is not in a particularly scenic location, set as it is among highways, a Maui Oil plant, a recycling center, and a wastewater treatment center. 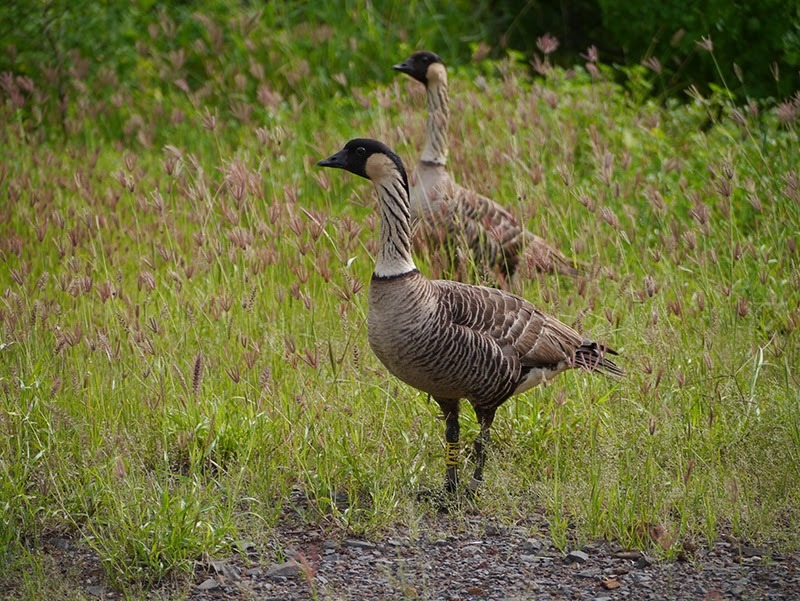 While it took us some time to find the entrance to the refuge that gave access to its walking paths (this entrance is off Amala Rd., not the more obvious gate with a viewing blind on the airport frontage road), we did enjoy the refuge once we got inside. 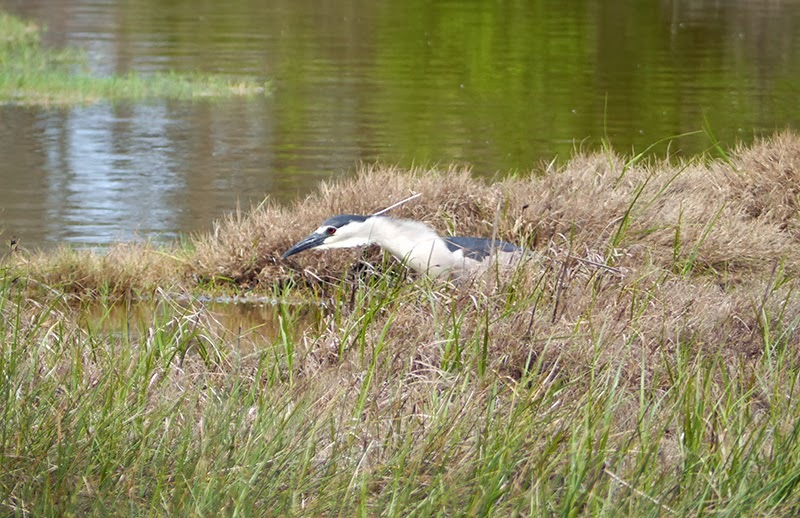 We did not see the diversity of species we expected, but we saw hundreds of stilts, a few coots, more nene, egrets, and a large variety of herons. 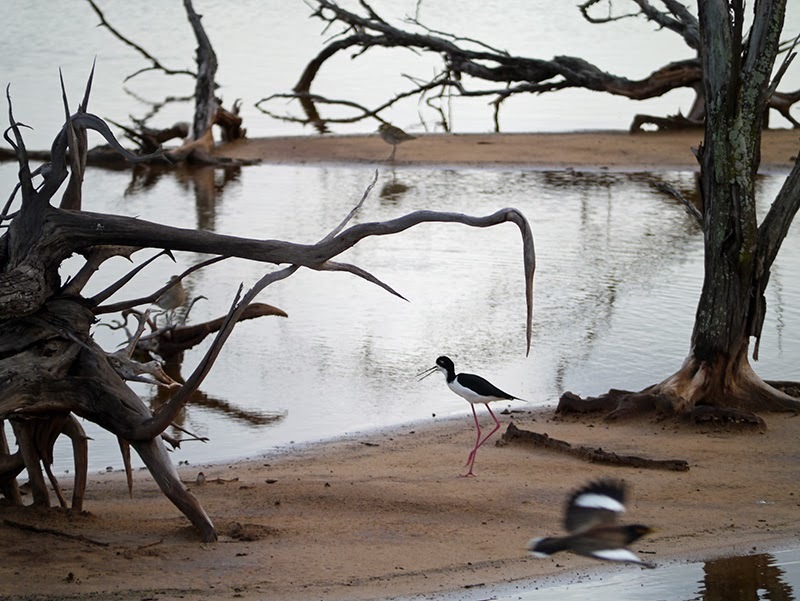 The Hawaiian stilt, or ae’o in Hawaiian, is a subspecies of the black-neck stilt of North America. 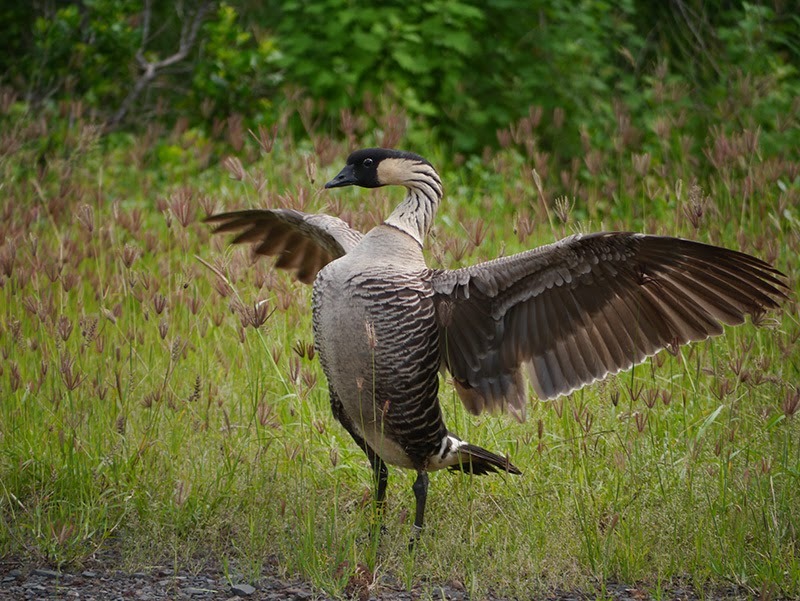 A fun fact about this bird is that it has the second longest legs in proportion to its body, only bested by the flamingo. As we were wandering through the bird sanctuary, we came across several types of what we thought must be old World War II ruins. 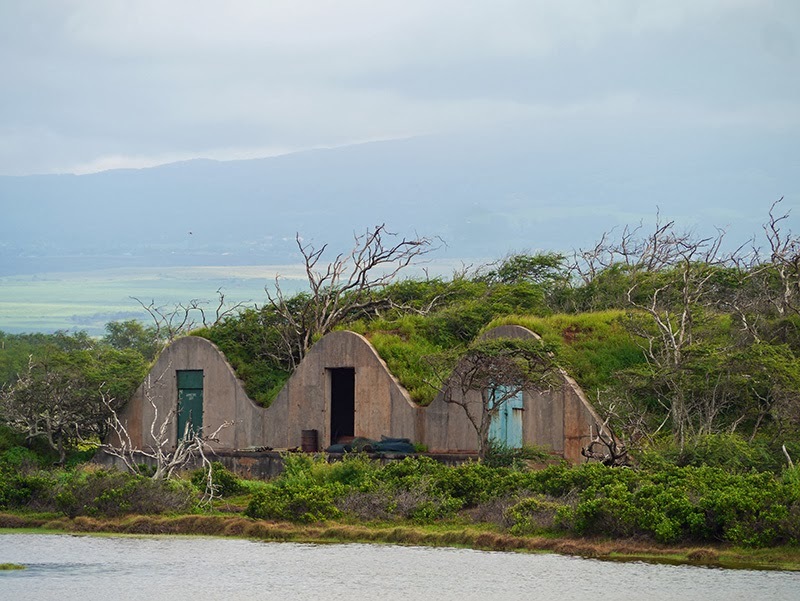 These bunkers had been camouflaged with sod, and I like the way that nature is reclaiming them. Before departing Maui, we made a stop at Honolua Bay on its northwest side, which is supposed to be one of the best snorkeling spots on Maui. Unfortunately, the bay was too crowded with snorkel tour boats (and the snorkelers themselves) to allow Silhouette to safely anchor, and it was too windy for Patrick to allow the boat to drift while I snorkeled. After checking out the bay and deciding against a snorkel stop, we set sail for the island of Molokai.